A young Russian entrepreneur is a dreamer. His dreams are called the "typical dreams of the Russian intelligent person". One of them is: "To finally find himself an executive director (a very good substitute) and deal with "strategy" ("creative work", "prospects", "new projecte" etc. –fill as you please) himself. And actually have a business structure as shown in the drawing just below the announcement to this article. "This isan item group. Develop it and advance". His dreams form a wish. Fulfilling the wish has its consequences. We will tell you 4 stories about the boons of wishes and their consequences. ABOUT "WHO WE ARE GOING TO ASK FROM"
N) And a whole set of fantasies. In reality, everything will be different. More likely, the "responsible employee" will not "close the topic" and will not "develop the idea", but will resign or degrade. And here, it is not a matter of personal qualities, but it is about the fact that what is voluntary or involuntary in the activities of a single person gathers very different work. Different in levels (for some, high qualification will be required, for others a low qualification, and for yet others another qualification is required). Different in costs (cheap, expensive, average, different). Different in responsibilities (some require a solution, others only execution, yet others dispatching etc.). There will also be the duplication of the works: the same functions, linked to different objects, will be executed by different people, in such a way that the number of people will still be superfluous. There will be a large number of "switching": not only from one work to another, but also from the work of one specific type to another type. As a consequence, there will be an unavoidable great loss of time, which as you already know, cannot be bought. In such conditions, even the good employee will pay more attention to different moments which are more psychologically usual, known, pleasant ("hence usual") to him etc.. However, we should pay (considering the present LEVEL of salaries, and not the formula) according to the most expensive moment. During the course of our profession, we have been gathering data about the efficiency (the relation between results and expenses) of the employee who are responsible for the whole cycle of the work "from the beginning to the end" in different companies throughout Russia, other countries of the CIS and Balkan countries, for already two decades. A typical diagram is illustrated below. Beware! 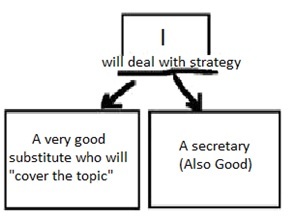 This diagram does NOT show the structure of work of the bad or lazy employee, but that of the typical employee –the one we actually do not want to fire, but instead praise and motivate. This is not happening because of the employee’s malevolence or laziness; actually the employee might be "toiling hard at work", but his efficiency will still be low. 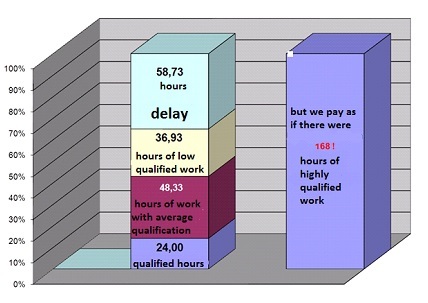 As you can observe from the diagram, the productivity is not at all a hurrah as compared to the salary. Let’s suppose that You employ a qualified specialist for a responsible position. During the interview, he solves complex tasks professionally (and his statement of service is not bad); the level of the salary will be set according to his best skills and his maximum qualification level, but it is very improbable that he will be loaded with highly qualified work for the whole month. Furthermore, the efficiency of the work will tend towards the one described in the diagram. First of all, the person who gets a high authority, but who does not work productively according to the conditions of the task (see above) – is a risk. Secondly, the possibility to detach himself from the company to his own business or to a competitor, as a matter of fact, together with the full cycle of possibilities and the whole Client database – is also a risk. Thirdly, the motivation of such employees – parallel to the development of the business – becomes more subtle and the dependence on them increases. This is also a risk. This is the story of the first good wish and its consequences. This is a story about the excessive trust in a piece-worker. A starting entrepreneur reasons in the following way: "If I place the salary of the employee in dependence to the end result, then the employee will want to earn more and thus, he will try to fulfill more (or even better…), since the more he does, the more money he earns etc.". Due to the obviousness and limited simplicity of this thesis, the starting entrepreneur does not subject it to analysis, according to the axiom. But "simple" and "trustworthy" – are not synonyms. First of all, the level of the salary on the market and the size of a specific business are not correlated. There are specific professions and there are their costs on the labor market. There are tasks which are handed over, and there is the price for solving them. And there is also the question, which everyone asks: "How much is such a specialist paid in our city?" Of course, a good employee can and should earn more, and a bad employee — less. However, the salary of analogous employees in different companies, cannot actually differ greatly. It can differ about 20–30%, but not as multiples, specially, not ten times more; although the income in a huge supermarket and in the "shop at the corner" can differ about hundred times. A worker sharpens pieces. This piece can either be expensive or cheap, lacking or in excess, contain gold or iron… but the worker will go to another factory, if there, he is offered more for similar works (irrespective of how the piece sells in either factory). And in order to retain a good worker, you will have to pay him a little bit more than what is paid in average on the labor market. And pay the bad worker - less (in fact, not too little, or it is better to fire the bad worker than to support a lowly-paid loser). Usually, a working Company sells its products according to the prices on its price-list and does not want to get a payment "from the profits" of its Clients. That is, he prefers to get a specific sum, at which its products have been evaluated by itself and the market. And this is correct. But usually a working Company should not count on the fact that its employees reason differently. Secondly, we shall ask the question: "Who was the budding entrepreneur imagining when he told himself that a per son who wishes to earn more during piece-work , will increase the net income?" There are just two answers: either he was imagining himself, or he was imagining the characteristics of an "ideal" person, an abstract "person at all". In his understanding, this is how people are motivated. This is exactly where we got the name for this error: "The Stimulation of angels". Most of them (even the active ones) prefer to reach a specific level in the beginning and then "avoid straining", but demand higher prices for better conditions or simply "monitor" the market, in order to know where people will go after resigning (where they are paid more), and not try to become richer through an increase in their personal efficiency.A smart manager understands this truth about people and asks himself questions like: "How should I find charismatic people and then create bonuses for them?" As compared to a starting entrepreneur, he forms his mission in a different way: "I should build a successful business with usual people. I should organize the business in such a way that the level of efficiency of the company surpasses the average efficiency on the market. Then I shall be able to solve motivation tasks, and our business will not depend on weak, average and any other kind of employees". Thirdly, for other equal conditions, there is a maximum threshold, which the employee will not exceed (while working in a specific manner or using a specific method, while professing certain principles etc.) no matter how much he is being paid. Excessive remuneration for limited values of efficiency will only bring destruction to the motivation. Hence, the world records in high jumping for the last 30 years has increased by 15 cm, and will not increase more than 10 cm for the next 30 years (though the income of jumpers has increases by factors of ten for that period of time). According to the data of "RTR-sports", Russian football players who played in the domestic championship with half empty stands for the infamous year 2004 (when they lost 1:7 against the team of Portugal) received from 400 000 to 730 000 conditional units each. Though the "level of the Russian football team" is well-known. The entrepreneur should define the limits of his business. The next growth is only possible for a new way of work or with a new business idea. This is the story about the second good wish and its consequences. There is so much propaganda in literature about the fact that when a worker takes part in the profit of the company, he stops considering himself as a hired employee but as a partner, and thus, he will have another motivation, he will be more loyal, more productive etc. The budding entrepreneur believes in all that. Maybe this is linked to the specifics of the work (law and order in the companies), but with the two decades of experience in working with entrepreneurs and in the consultation activities, we have not met hired workers who, after receiving a part of the profit, would wake upp with a flame in their eyes and start running to "get profit" for their dear enterprise. However we saw hundreds of people, who after receiving options, started to discuss the topic about the fact that in "the "Google" company, the employees not only get bonuses, but they also receive massages, however we do not get such privileges". And this is not the most complex situation. The most complex one is when the person simply goes out of his mind and instead of thinking about increasing the incomes, he thinks about “where he is being left” (and we remind You, that we are talking about motivation). The adoption of the principle of "partnership" with the employee who takes part in profit, is very sly. A partner is the person who has something to risk, one who has invested his resources or part of his property in the business and who will lose them if the enterprise will not be successful. That is why, such a real partner will take part in the profit when it is present. And when it is not there, he will take part in the losses. Intermediate condition 1 (wage + part from the profit, when it is existent) – it is a sly move I relation to the entrepreneur, since in case of losses, the employee obviously will not bring any money in. He is not a partner. Intermediate condition 2 (there is no profit and hence no salary) – a sly move in relation to the employee, "hanging" the responsibility of the entrepreneur and the risk of his business on his subordinates. When You hang over Your responsibilities, You stop being a partner all along. That is why "West is West and East is East". This was the story about the third good wish and its consequences. Best is a rarity, average is the norm. There are more "leftovers" and "below-average" workers on the market, that is, only "average and weak" ones, leaders are scarce. Successful companies do not tend to tell everyone the real secrets. The distribution of any model on the market does not speak of their success and efficiency. What is said above is fair for "percentage payment" as well (bonus "from turnover" or "from profits"): there is a lot of it on the market, and its effect is low. Since many factors affect the profit/turnover, the link between the salary and results of labor are not noticeable. In this case, the bonus is "not transparent". It just changes into some value, the origin of which is not understood by the employees. And of course, nobody is going to show the profit and the structure of expenses to the employees. This is shown to the share-holders. а) A large one-time (sometimes, unexpected) "turnover making" order will not cause further workload, but the salary will increase and as a result, motivation is destroyed. And on the contrary. When the main work while servicing the long-awaited Client begins and new Client incoming is not expected, the employees may "righteously" ask: why their salary is "dropping" as compared to the preceding "profitable" month when they are now applying more efforts and labor force. б) Many in the company unconsciously develop a distaste for cheap goods and services, they try to avoid working with them and consequently develop a distaste for the Clients who buy them. As a result, the link between salary and results of labor is lost. Here there is also a marketing consequence. Let’s consider, as was said in adverts in the nineties, "a simple and usual shop", in which there are cheap and expensive goods in the same trading zones. In fact, one brand of televisions (for example, "Samsung" or any other) can have some items costing 8000 rub., and others costing 170 000 rub., and yet supplementary accessories to the products of the same company can even cost 1000 rub. If a salesperson does not approach You for a long time in such a "simple usual shop", while You are standing near the "antenna filters", it would be very improbable for You to go to the television costing 170 000. If they approach You quickly, as compared to the salary model, Your opinion will not be erroneous. Obviously, such a relation will affect the structure of sales. Then, the marketers of the "simple shop" will analyze the sales of the previous periods. They will see that the main turnover comes with expensive goods and cheap ones are sold rarely. Of course, they will recommend an increase in the purchase of those items which sell best and reduce those which "do not sell". After some time, Clients will stop visiting the shop and when they will be questioned, the Clients will say: "There is nothing there to buy". The shop itself will thus have a whole lot of expensive illiquid items and a deficiency of "turnover", hence it will increase its credit.… until it reaches default. "standard" on turnover, rapidly set by the employees of the enterprise, — 1000 000 rub. We can believe in the fact that "people try", but it is best to set the standards ourselves in our business (by basing ourselves on the business-idea and parameters of the business plan, and not on the wishes of the employees) and organize work in such a way that usual people could reach the targets, without having to perform selfless exploits. The ability to organize work actually comprises the skills of the management and the Entrepreneur. And this is bad. By normalizing work, "idleness" should be eliminated. Profit on services (goods) decreases with an increase in competition, but average market salary often (with the same increase in competition) increasesAnd since they are not correlated, those who wish to pay "from profit" have to find an artificial fitting which, simply, does not have a logical explanation. This was the story about the fourth good wish and its consequences. A budding Russian entrepreneur – is a dreamer. And though it is said that: "It is not a sin to Dream", the contrary is yet more present in the Russian business, than results. In order to correct this, read www.triz-ri.com, where material is published about the present structure of business. This material is published on the site "Open methods in advertising and PR "Advertising dimension" 11 October 2011. Earlier it was published in the journal "Management without rules", N1, 2011.